This mushroom soup is extremely delicious. In retrospect, the mushrooms in this picture were unnecessary. Put down that book! Look to your left! Today we made this soup together. Because I have really good friends. Who are nice enough to pretend like they care about Souper Sunday on my Playing With My Food blog. And didn't want this to be the first Sunday this year that I didn't make a post simply because of extreme slothenliness (I may have just made up a new word...don't know, I am too slothenly to check today) and lethargy after a girls weekend jammed with junk food and booze. I have really good friends. So together we made this Ina Garten (aka Barefoot Contessa) version of Cream of Wild Mushroom Soup, and it is very, very good. We gobbled it up for a late lunch today while we were still out of town, and now I am back at home and I'm having to try my best not to eat the plastic container of soup that has been portioned out for my lunch tomorrow. Sorry, not eat the plastic container of soup but rather the soup that is inside the plastic container of soup. Instead I am eating chips, so that's good. This recipe is fairly easy to make, and definitely a nice one to make with friends or a partner because there are two different things going on at one time. 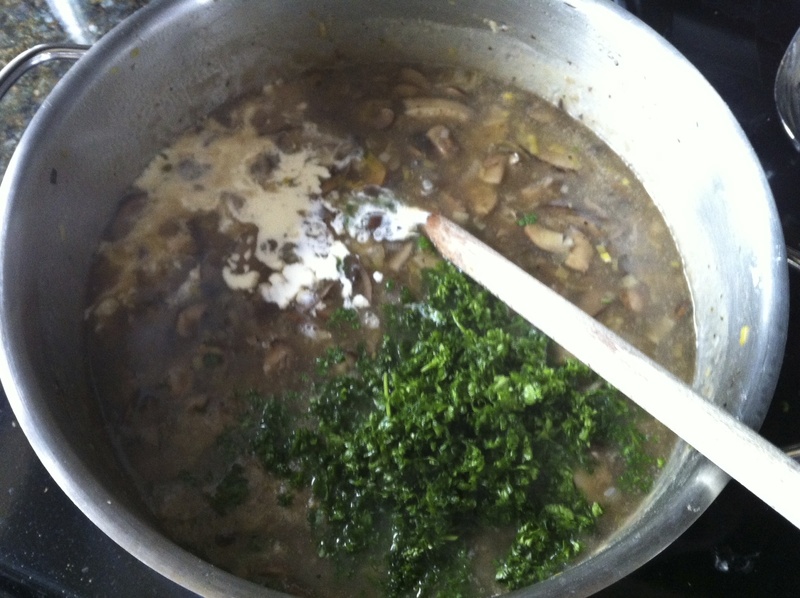 You first have to make a delicious mushroom / vegetable broth, and at the same time you have to make the mushroom / leek / cream base. It's better to have a second person working on this with you because not only is it much more fun but it greatly reduces the amount of time that you spend preparing your meal (this is not to say that one person could not expertly create this meal on their own). 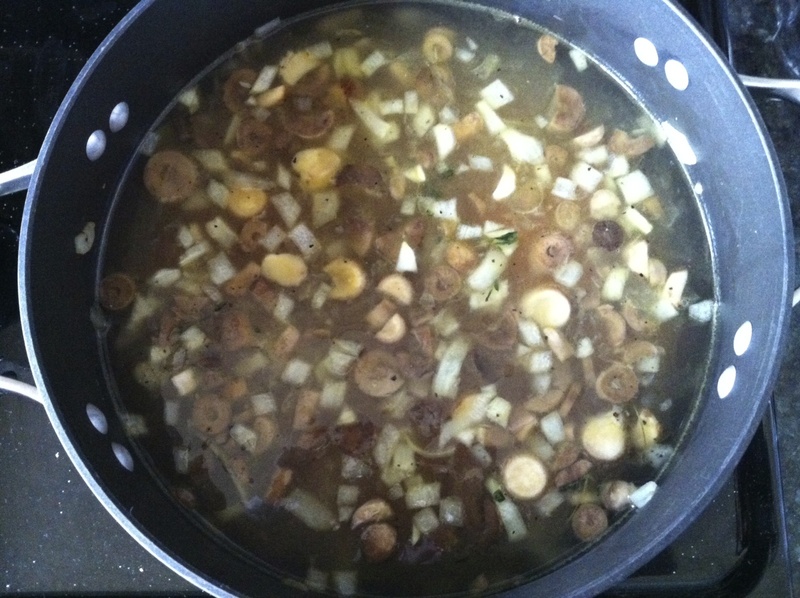 This second person that I speak of would never be The Hubby because of his hatred for mushrooms (except on pizzas where he actually orders them...I don't get it), so a girls weekend was the perfect choice for trying out a mushroom soup recipe. The person at my side making this soup today was my pal Cleary, and when left with the problem of using one cup of white wine for the recipe and not knowing what to do with the rest, we were able to simply pour the remainder into three glasses for me, my sidecook (get it? instead of sidekick) Cleary, and our other gal pal Ashley, and keep enjoying the girls weekend. Cleary teaching me onion chopping technique. I forget already though. I hope you enjoy this recipe...this is being added to my 'keeper' list! 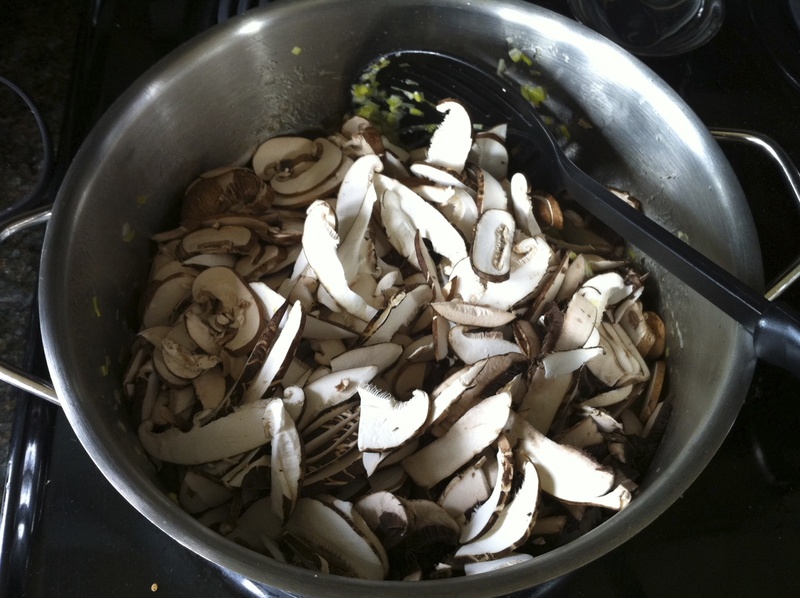 Clean the mushrooms with a vegetable brush or a dry paper towel...don't wash them with water! Remove the stems from the mushrooms, trim off any bad parts, and then chop the stems. Slice the mushroom caps 1/4-inch thick and set aside. To make the stock, heat the olive oil and 1 tablespoon of the butter in a large pot. 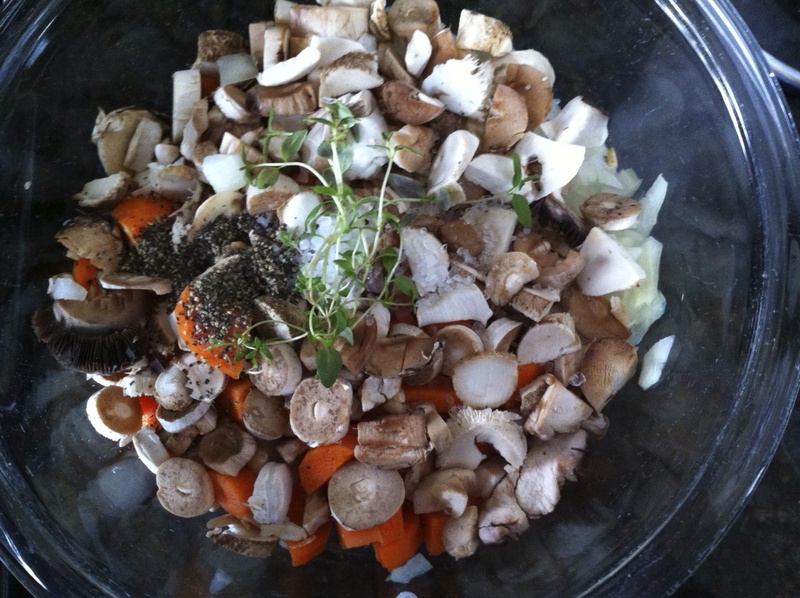 Add the chopped mushroom stems, the onion, carrot, the sprig of thyme, 1 teaspoon salt, and 1/2 teaspoon pepper, and cook over medium-low heat for 10 to 15 minutes, until the vegetables are soft. Cleary and me - broth straining maniacs! You should have about 4 1/2 cups of stock, but if not just add some water. Meanwhile, in another large pot, heat the remaining 1/4 pound of butter and add the leeks. Cook over low heat for 15 to 20 minutes, until the leeks begin to brown. 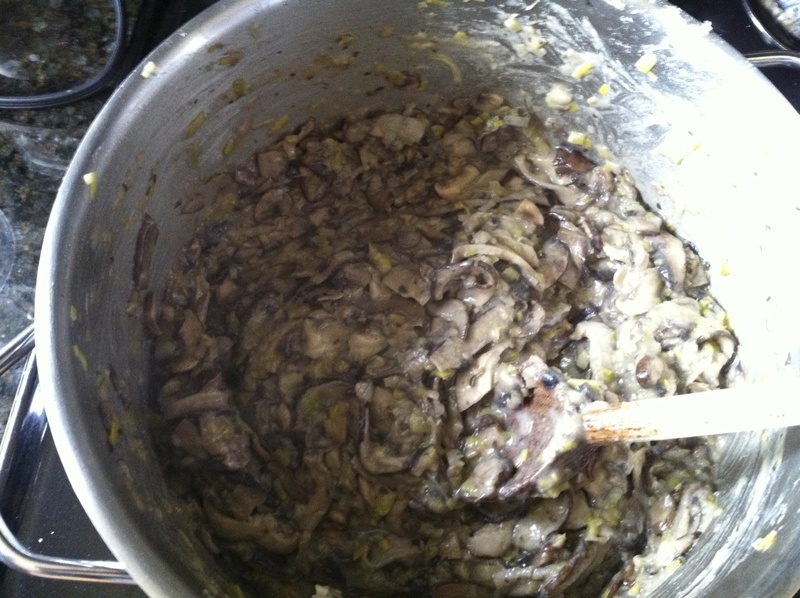 Add the sliced mushroom caps and cook for 10 minutes, or until they are browned and tender. Add the mushroom stock, minced thyme leaves, 1 1/2 teaspoons salt, and 1 teaspoon pepper, and bring to a boil. Reduce the heat and simmer for 15 minutes. Add the half-and-half, the cream, and the parsley. Season with salt and pepper to taste, and heat through but do not boil. Serve hot. MMM! Mushroom Soup is one of my faves. This looks delish! 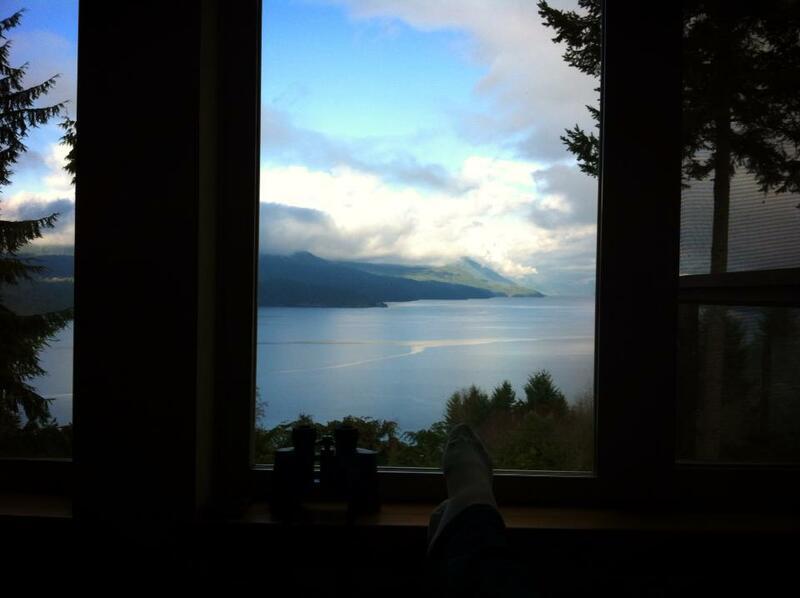 I love Sechelt, its beautiful there. Cute blog. I am a new follower! Thanks Robyn! I just signed up to follow your blog too! Question - on Google Friend Connect, how do you get it to display Whats Hanging as your name rather than your actual name? Sechelt - soooooo beautiful! Can't wait to go back when the weather is warmer. Thanks for popping by! 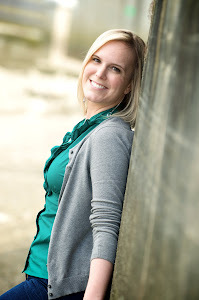 I just checked out your blog and love it! I will be reading.